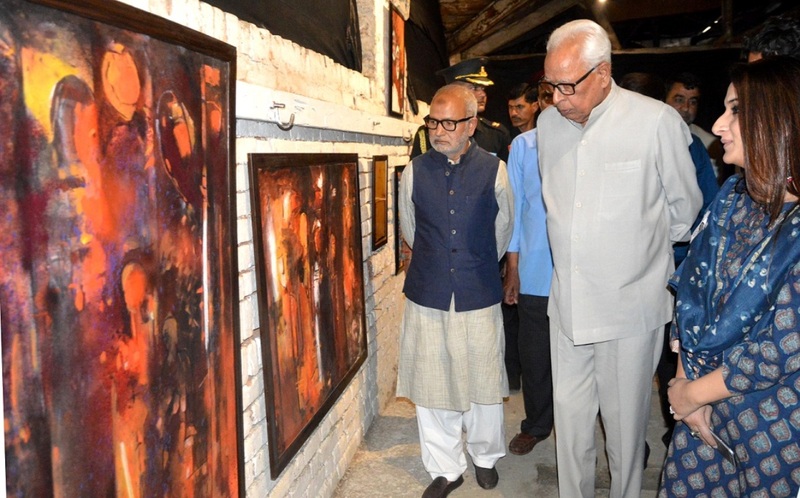 Governor N N Vohra on Sunday inaugurated the “9th Annual Contemporary Art Show-Concourse” here this evening. This 8-day mega exhibition in which 60 Kashmiri artists from all over the world have come together for the first time in 66 years has been curated by eminent artists Veer Mushi and Syed Mujtaba Rizvi. Naeem Akhtar, Minister for Culture was present on the occasion. Welcoming the artists to the Valley, Governor congratulated Munshi and Rizvi for organizing this exhibition which is particularly significant as it seeks to revive artistic traditions of the Valley after a gap of several decades. Governor recalled that during the earlier years, during his visits to the Valley he had the opportunity of meeting many eminent artists, sculptors and painters, locals, and outsiders who were frequently visiting Kashmir to seek inspiration from its people and enchanting scenic beauty. He recalled his meetings with Triloke Kaul and G R Santosh, among others. Governor noted with sadness that the post-1990s turmoil in the Valley had done irreparable damage to art and culture. Responding to the enormous effort made by artists Munshi and Rizvi to organise this exhibition in the Old Silk Factory, which had been declared an unsafe building, Governor observed that this historical premises could be redone to provide a permanent Art Gallery for attracting the Kashmiri Pandit artists and others who had been compelled to leave their homes. Naeem Akhtar, Minister for Culture, stated that he shall give orders to convert the Solina Factory into an Art Gallery while maintaining the original architecture and ambiance. Akhtar stressed the importance of such initiatives being organized regularly so that Kashmiri Diaspora could connect to their roots and enrich the arts scene here. Later, Governor and Minister for Culture went round the exhibition and viewed the paintings in different mediums, photographs, and sculptures.